Stahl opened a Center of Excellence for Performance Coatings in Suzhou, China. The environmental friendly center will focus on innovative performance coating solutions for a wide variety of materials. Customers, OEMs, brands and other partners came together for the opening event. The new facility in Suzhou is the company's ninth worldwide Center of Excellence. The new Center of Excellence has been equipped with solar panels providing part of the electricity that is consumed by the lab. A solar illumination and motion-detective lighting system were implemented to save electricity. Green plants on the rooftop enable temperature control during the hot season and the investment in a high-efficiency air filter system guarantees clean air emission. Also, the choice for low VOC boards for the partitions and recurring construction materials contribute to the sustainability of the Center. “We strive to make coating solutions with the lowest possible impact in terms of people’s health and the environment," said Hagen Chen, managing director Greater China at Stahl. "Over the last few years, our performance coatings business has been growing enormously in China, especially in the automotive industry. The requests for applications for seat and trim, elastomer coatings, and flock adhesives are growing on a daily basis. 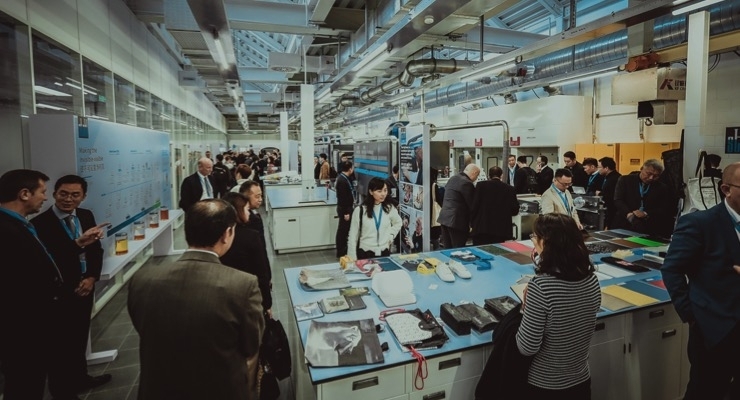 Besides the automotive industry, the new facility anticipates the growing demand in China for packaging film and paper, synthetic materials, coated fabrics, textiles, and specialty applications like medical and supportive gloves." Guests at the opening event were treated to a "highway-to-excellence" experience. The ceremonial opening was attended by local authority members of the Suzhou High Tech New District. Among the speakers were Lydia Lin, East Asia director zero discharge of hazardous chemicals, who spoke about the importance of a DMF(A)-free industry. Terry Ragunath, from HP Inc. Large Format Printing Division, talked about the company’s new partnership with Stahl to increase the durability of printed synthetics. Stahl’s Uwe Siebgens, group director Performance Coatings & Polymers, spoke about the future of performance coatings.